RYA navigation courses - Chapter 7 Tide prediction from charts and tables. The depths and heights in the chart need a plane of reference: the chart datum (CD). Depths are usually described with respect to low water reference planes (yielding lower charted depths, which are safer), and heights are shown with respect to high water reference planes (again, yielding lower vertical clearances on the chart, which are safer). As such, the chance that the observed depth or vertical clearance beneath a bridge is smaller than the charted depth or height is rather small. The term clearance height is synonymous with vertical clearance. Note, planes of reference are not exactly as shown above for all charts. Check for possible notes under the Chart Title. The image above also shows that observed depth = charted depth + height of tide, and note that observed depth is synonymous with depth of water. Furthermore, observed depth = height of tide - drying height. Charted depths or soundings are indicated on the charts by contour depths (areas with different colour denoting a certain depth level), contour lines and spot depths. These soundings are reduced to the CD, usually Lowest Astronomical Tide (LAT) in tidal waters. A sounding or spot depth like 35 indicates 3½ metres of water under LAT, whereas an underlined sounding like 04 indicates a height of 40 cm above LAT. Heights above CD on drying areas are given in metres and decimetres, where the metres figure is underlined. Depths are given from 0.1 to 20.9 in metres and decimetres, and from 21 to 31 in metres and half metres. Greater depths are rounded down to the nearest safest metre, e.g. 32.7 metres is rounded down to 32 metres. The geographical position of a sounding is the centre of the depth figure. The term current is used to describe water movements which are generally constant in direction, and are not dependent on astronomical conditions, hence non-tidal. rotary tidal streams occur where the water is less restrained, allowing a continually changing direction rotating a full 360° in each tidal cycle. Although this gives rise to the term rotary, the flow is considerably stronger in two approximately opposite directions than in any others. Streams and currents are described by the direction towards it is running. Only surface streams and currents are charted or tabulated for surface navigation. Breakers over off-lying shoals are charted by to avoid obscuring the shoal soundings or feature. Tidal level squares (see the example on the left for location “f”) are shown on nautical charts at locations where tidal levels have been measured. Levels are included in the same chart and tabulated in a tidal level table, such as the three examples below. There are different table variations for semi-diurnal, mixed semi-diurnal and diurnal tides. Note, that the coordinates don't give the leading zeros, especially the longitude positions, e.g. 2° W instead of 002° W. This to safe space and reduce chart clutter, also see the style guide. 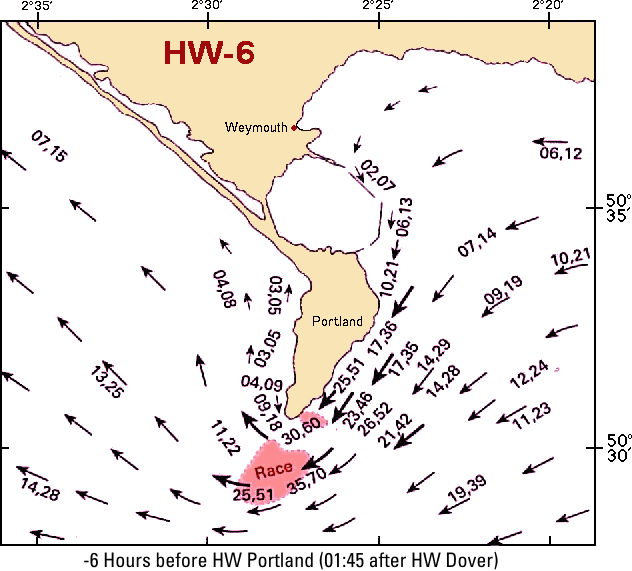 Tidal diamonds (see the example on the left for location “D”) are shown on nautical charts at locations where tidal stream information has been measured: set (direction) and rate (speed). This information is included in the same chart and tabulated in a tidal stream table, such as the example below. Note, that “Dir” is direction towards as opposed to wind directions! Furthermore, “Np” stands for Neap tide and “Sp” for Spring tide. The direction or set is given in degrees. The rates or speeds for spring and neap tides are given in knots. Eastbourne in this example serves as a reference port. At high water at Eastbourne and the hours before and after HW Eastbourne, the rates and sets are tabulated for the locations of these three chart diamonds. Tidal diamonds give the tidal streams at that location only, a nearby diamond may yield very different sets and rates; sensible interpretation and comparison may be used to estimate the streams at intermediate positions. An atlas is a collection of maps or charts, and is named after the Ancient Greek mythological figure Ἄτλας “Bearer (of the Heavens)”, and a tidal atlas presents tidal stream information in the form of 12 or 13 chartlets, one for each hour of the tidal cycle. Above is an example of one chartlet, part of a set of 12, featuring Portland Bill (South England) 6 hours before HW Portland. 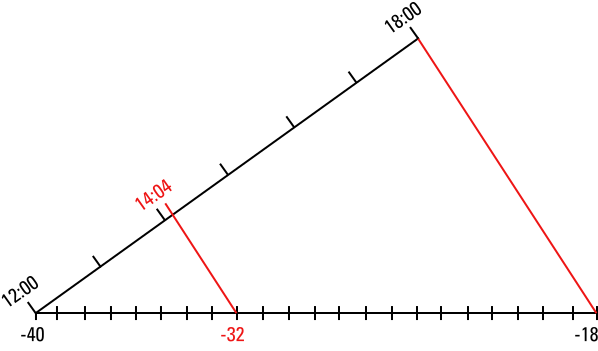 The arrows indicate the direction (set) of the tidal stream, and their length and thickness give an impression of its rate. More accuracy is given by the numbers, arranged in pairs, that show the rate in tenths of knots at neap and spring tides. For instance 37,52 gives a neap tide of 3.7 knots and a spring tide of 5.2 knots. The comma indicates the geographical position to which the figures refer. To interpolate for tides that are between neap and spring either the rule of seven or an interpolation chart enclosed in the atlas is used. The image below shows all the 12 (in this case 12) chartlets of Portland Bill together, click to enlarge. Tidal atlases provide not only a graphical version but also show a wider area, and are therefore a very useful addition to the tidal stream diamonds. Where tidal diamonds have the advantage of precision, particularly in terms of direction - which can be difficult to measure on the chartlets of a tidal stream atlas - the latter has the advantage of creating a good overall view of the changing patterns of the tidal streams, especially for positions in between tidal diamonds. Both types of presentation use relative times with respect to HW at a particular port, instead of clocktime. Online resources such as Yr - again showing Portland Bill are to be used alongside the paper publications as well as the tidal layers of the chart plotter. 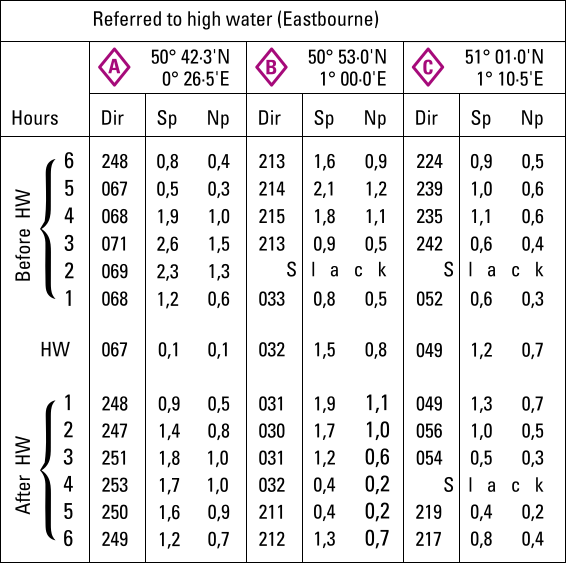 The online and electronic versions will often allow animations and selecting a specific arrow will usually show set and rate, with the precision of a tidal diamond. 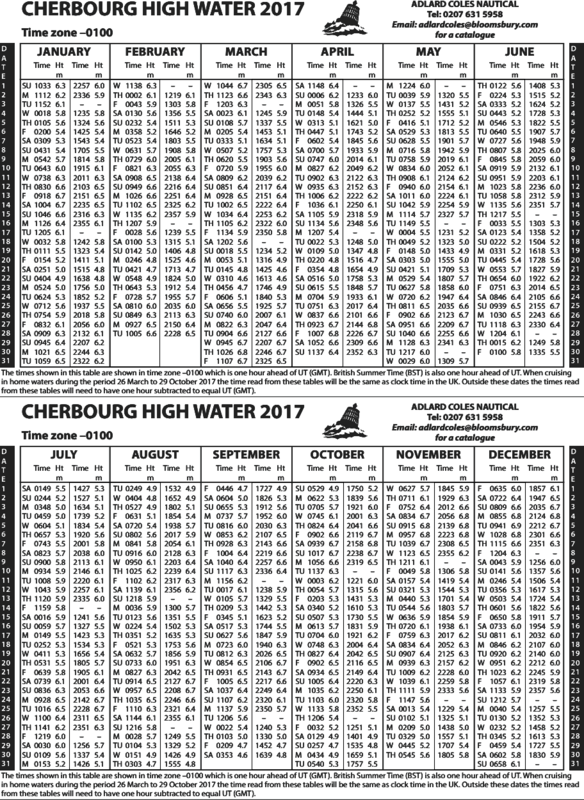 There are many tide table variations across countries and some mention times for high water only (view Cherbourg). More often the lunar phases 🌑 🌒 🌓 🌔 🌕 🌖 🌗 🌘 🌒, or neap and spring tides, or time difference between the two are added (i.e. Spring tide occurs two days after full and new moon.). Furthermore, dates to with daylight saving time applies can be conveniently indicated (view Dover). The image below shows a portion of a typical tide table for any standard port. Note, that in (mixed) semi-diurnal tides, the tidal period is 12 hours and 25 minutes: from high tide to the next high tide. Therefore there are days, like Wednesday 2 January in this example, with just three entries. Times, in meteorology as well as nautical publications, are given using the 24-hour clock, based on the standard time of the country concerned. When a daylight-saving scheme is in operation, an hour has to be added to the time shown in the tide table or weather forecast in order to convert it to clock time. The UK uses GMT (Greenwich Mean Time) and BST (British Summer Time in the summer months) as local time, but for instance France, Belgium and the Netherlands are one hour ahead, since located in the adjacent time zone; UTC+1. In order to convert a French tide table into GMT substract one hour. Most yachtsmen prefer to work in local time, rather than referring back to a home port's time zone. GMT, CET (Central European Time; UTC+1) or for instance EST (Eastern Standard Time in the USA, New York; UTC-5) are time zones and based on the rotation of the earth. UTC (Coordinated Universal Time) = Z (Zulu time) is not a time zone, rather is based on the caesium atomic clock. For navigational purposes both UTC and GMT (though now obsolete outside the UK) are regarded as interchangeable, yet UTC is recognized globally and the time zone offset should always be written as UTC±00. Notations with a colon (:) will also emphasize the correct meaning of 1 hour and 10 minutes (70 minutes) and not 110 minutes. Tide tables give the heights for HW and LW each day, but to calculate the heights of tide between high and low waters, the standard ports have associated tidal curves published. It is far more likely that intermediate heights and times are required when entering/leaving a harbour, especially if there is a bar or sill (cill) to cross. the time associated with a particular height of tide. Alongside the curve is a Mean Ranges box that states the average ranges of spring and neap tides. The image below shows a typical tidal curve for a standard port with both spring tide and neap tide drawn. Here the mean range at spring tide is 4,9 m and and neap tide is 2,4 m.
The time used in this example is 15:50 on 3 January of this year (see excerpt of the tide table below). On this day there are two low waters at 06:45 and 19:20 as well as two high waters at 00:43 and 13:01, all are local times and also no correction is needed for daylight saving time. The ranges (the differences between the high and low waters) indicate near or at spring tide on this day: 5,5-1,0=4,5 (near spring) and 4,7-0,8=4,9 (spring). Follow the six steps, in the filled-in tidal curve below, to learn how to find the tidal height at 15:50 at this standard port. To fill in a tidal curve either use pen + tracing paper or a soft pencil. The tide table for 3 January shows that it is spring tide, since 5,7 - 0,8 = 4,9 metres range, which is equal to the spring tide range indicated on the tidal curve. Draw a line from the low water heights (at the bottom) to the high water heights (at the top). In this example the line is drawn in red to emphasize spring tide. Since 15:50 is after HW, start with adding 13:01 at HW and fill in the subsequent times for the hours after HW. At LW the time of 19:20 is added to illustrate that, although the curve uses the 12 hours, the tidal period is longer. Arguably, the following times should be added to the curve: 13:01 , 14:04 , 15:07 , 16:10 , 17:13 , 18:16 , 19:20, yet this practice is more complicated and would not make a significant difference! Using the added times after HW, plot the time of 15:50 on the horizontal axis of the curve. End drawing the vertical line where it intersects with the red spring tide curve. 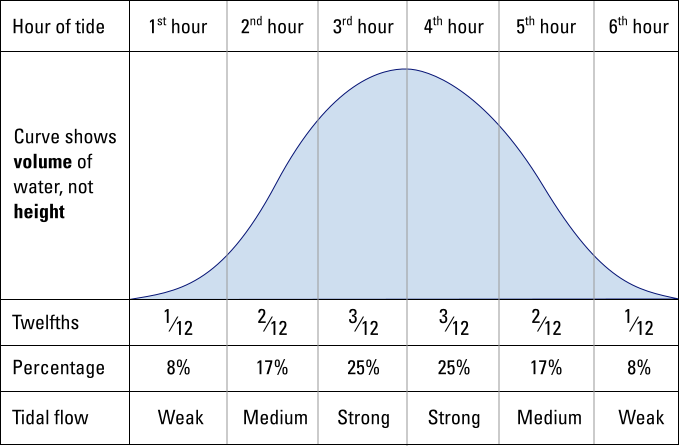 Often the neap tide curve (dotted line) has a different shape. End drawing the horizontal line where it intersects with the drawn diagonal. From the intersection draw a vertical line (upwards is handier) and find the requested height of tide: 3,5 metres that corresponds with 15:50. This answer can be verified using by the factor scale show above HW: 0,8 (start point of the range) + 0,56 (factor) * 4,9 (range) = 3,5 height of tide. 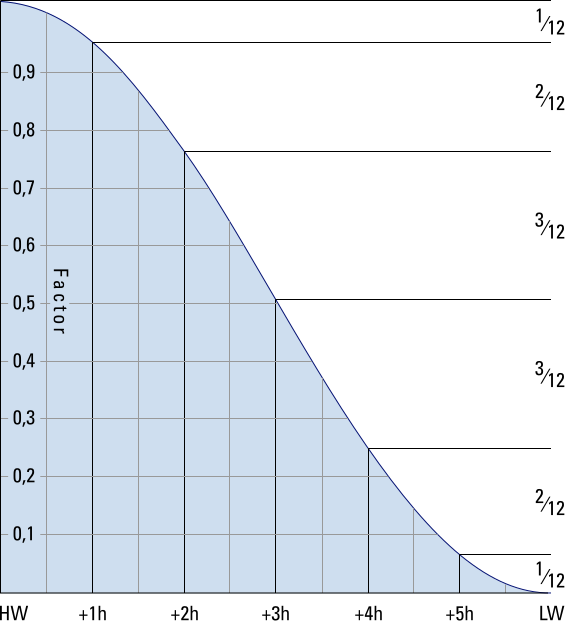 The tidal curve can also be used to find the times associated with a particular height of tide, for instance a 2 metres minimum height of tide that would allow passage across a bar. In the example below six steps will lead from the desired height to specific times. The tide table for 3 January shows that it is spring tide, since 5,7 - 0,8 = 4,9 metres range. Draw a line from the low water heights to the high water heights. In this example the line is drawn in red to emphasize spring tide. Start from HW and work towards both LWs. Start this line at the top scale at 2 m and end drawing where it intersects the diagonal. This horizontal line will intersect red spring tide curve twice. One of these lines meets the time scale on the left side of HW, the other on the right side of HW. In this example the height of tide will be 2 m at 08:52 and at 17:05. Between these times the height of tide will be larger. Many of the more picturesque harbours and attractive anchorages visited by yachtsmen are classified as secondary ports. Since these smaller ports are of less commercial or military importance than standard ports neither tidal curves nor full tide tables are available. Fortunately, often the differences with a nearby standard port are tabulated by which it is possible to use standard port tidal information to yield predictions for a secondary port. The image above shows the tidal difference table for MicroLimani (i.e. “small port” in Greek) as the secondary port and MegaLimani as standard port. This example uses the afternoon of 16 May, for which the detailed tide table (excerpt below) for the standard port of MegaLimani gives HW 14:04 at 3,7 m and a subsequent LW 19:54 at 0,6 m.
HW 14:04 is approximately 2 hours after 12:00 where the tidal difference table shows -40 minutes, and is approximately 4 hourse before 18:00 where the tidal difference table shows -18 minutes. In these six hours the time difference decreases with 22 minutes. In two hours and four minutes a decrease of 22/3 = 7,3 minutes, resulting in -40 - - 7,3 = approximately -32 minutes. Therefore, if HW MegaLimani is at 14:04 then HW MicroLimani will be at 13:32 local time. Instead of the calculations, there is a second interpolation method by means of drawing a graph as below. Start by marking the two blue axes: horizontally the time differences; and the angled axis with the times (or vice versa). Then mark the time 14:04 along the time axis. Finally, draw the small red line perpendicular to the larger red line. In case of daylight saving time the last step would be to add 1 hour. for the secondary port MicroLimani can be found, mutatis mutandis, with the same methods. 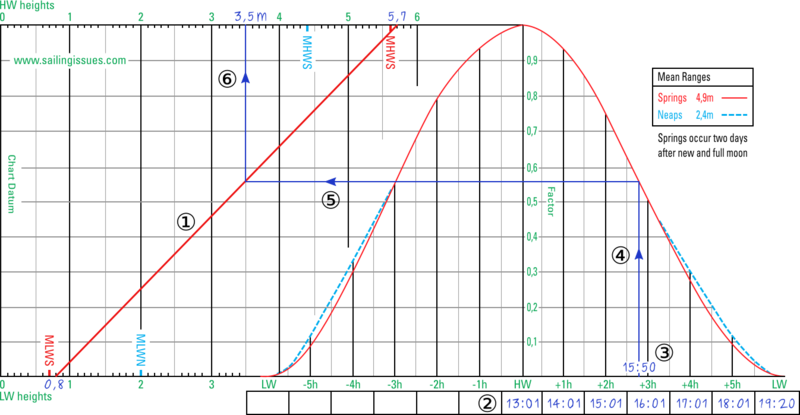 For heights of tides between LW and HW the tidal curve of the standard port is used. The “rule of twelfths” is a simple method to - roughly - interpolate tidal heights between HW and LW, and without a tidal curve. Tidal curves are usually only available for standard ports where most sailing yachts would have ample water anyway; not in out of the way anchorages and smaller ports. So how to determine the height of the tide that is available to safely approach a depth restricted anchorage, harbour or pass over a sand bar? All that is required to apply the rule of twelfths is the times and heights of both high or low water. From the difference between the tidal heights of high and low water the range can be calculated. 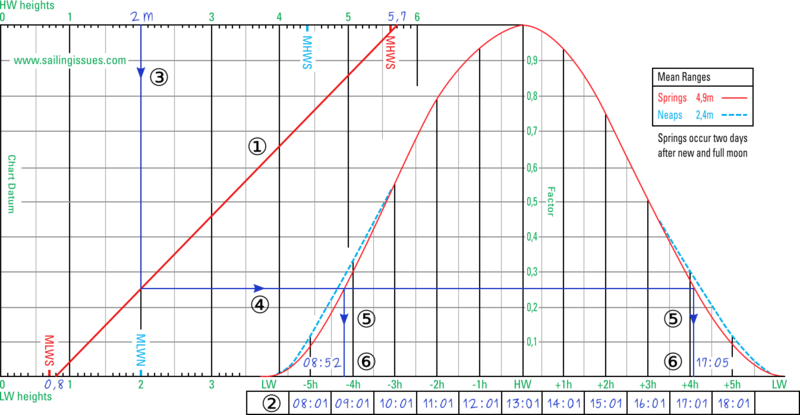 The image below shows an idealized semi-diurnal or mixed tidal curve, i.e. a sinusoid with a period of 12 hours, from HW to LW. During the first hour after HW the water drops 1⁄12th of the full range. Hence, two hours after HW the water has fallen 3⁄12th of the full range. Some geographical locations do not have such a uniform curve. Very good examples of this can be found along the south Coast of England, e.g. the Solent and Poole harbour have double high waters and Weymouth Bay has double low waters. In these instances, the rule of twelfths is ineffective and tabulated data online and in almanacs become vital. Similarly to tidal levels, the rule of twelfths can be used to - again, roughly - estimate tidal streams. The image below shows that the flow or rate of the stream is greatest during the third and fourth hours. To interpolate between spring and neap tides we use the rule of seven. Since the change from spring range to neap range can be assumed linear (instead of sinusoid), each day the range changes with 1⁄7th of difference between the spring and neap ranges. Hence, the daily change in range is (spring range - neap range)⁄7. Beside interpolating for ranges the rule of seven is also used to find rates of tidal streams between neap and spring rates, see tidal atlases. Shown below is an example of a semi-diurnal tidal level table found in the chart - see the tidal levels section above, in this case for both the port of Dowes and for a position just south of Dowes. how many hours before or after HW? how many days before or after spring tide? Using the times of high and low tides at the nearest standart port. And the tidal difference table for Dowes. Once both relative times are known, the two following problems can be solved. A standard navigational problem is to establish whether the height of tide allows the crossing of a shoal, or, if not, the time at which the tide will have risen sufficiently. The shoal at Dowes has a charted depth of 1 meter, which needs to be crossed at about 15:00 hours with a yacht with a draft of 2 m.
HW occurs at Dowes one hour later = 16:53. Spring tide is due in two days. <=> 4,8 - 2 x ( ( 4,8 - 3,1)/7 ) <=> 4,8 - 2 x 0,25 = 4,3 m.
which is Spring HW - 2 days x ( (5,2 -4,3)/7 ) = 5,0 m .
5,0 - 3/12 x 4,3 = height at 15:00 hours = 3,9 m.
So, after three interpolations we derive the water height at 1500 hours. Considering the charted depth leads to an observed depth of 4,9 meters, enough for our draft of 2 meters. Clearance under the keel in calm weather and no waves or swell should be 0.5 m minimum. Good practice however is to have at least a clearance of 1 meter + wave or swell height. An overhanging rock, power lines or bridges have their clearance heights charted with respect to another chart datum than LAT. Often, Highest Astronomical Tide (HAT) is used as the reference plane for vertical clearances. Above our shoal hangs the 'Cowes bridge'. At 15:00 hours we would like to pass this bridge, which has a charted height of 20 meters to HW. Our mast is 23 meters high. In the example above we found that the water height was 1,1 meters below HW level at that time. Obviously, we will have to wait! So, at what time will we be able to pass under this bridge? The water height must be 3 meters lower than HW level (5,0 m). That is almost 9/12 of the range (4,3 m) indicating four hours after HW . Conclusion, we will have to wait at least six hours in total. The astronomical factors (moon, sun, axial tilt, orbital tilt… see chapter 6 - The astronomical origins of tides) result in very accurate tide predictions, and even for complex coastal situations with estuaries and islands, local calculations and observations still give tidal levels with a precision of minutes in time and decimetres in height. For standard ports, shipping lanes, etc. these predictions are published on nautical charts, in tidal atlases and tide tables. Yet, local wind and weather patterns will also affect tides and are obviously not taken into account in these publications. Strong offshore winds can move water away from coastlines, exaggerating low tide exposures. Onshore winds may act to pile up water onto the shoreline, sometimes even eliminating low tide exposures. A prolonged force 5 blowing onshore (a temporary wind-induced current) can raise the sea level by 2 decimetres. High-pressure systems can depress sea levels, leading to clear sunny days with exceptionally low tides. Conversely, low-pressure systems that contribute to cloudy, rainy conditions typically are associated with tides than are much higher than predicted. Every extra 11 mbar of pressure (Greek: βάρος baros, meaning “weight”) can affect a change of 1 decimetre. The combined effect of wind and barometric pressure typically produces variations of roughly ± 2 decimetres in height and ± 10 minutes in time, yet with extreme northerlies blowing down into the funnel-shaped North Sea, for instance, a raise of 2 metres and with a storm tide even 5 metres is possible. Although tidal calculations should be carried out as meticulously as possible, their accuracy should not be relied on. Furthermore, even a small distance away from the actual position of tabulated tidal data could mean significant differences in times and tidal heights, set and rate. The wave conditions or sea state can be influenced by either tidal streams or winds, or by a combination of winds and tidal streams. Overfalls, races or tide rips arise where strong tidal streams are deflected upwards to the sea surface or are broken up into turbulence by obstructions on the sea bed. These localized phenomena result in steep and irregular waves close downtide of the obstruction. Though the severity of the overfalls is affected by certain wind conditions, they originate from the tidal streams and are not created by winds, hence they can be predicted and recurring and are marked on charts as a potential hazard. Tide: The vertical rise and fall of the surface of a body of water caused primarily by the differences in gravitational attraction of the moon, and to a lesser extent the sun, upon different parts of the earth when the positions of the moon and sun change with respect to the earth. Tidal Day: 24 hours and 50 minutes. The moon orbits the earth once earth month, and the earth rotates (in the same direction as the moon's orbit) on its axis once every 24 hours. Tidal Cycle: A successive high and low tide. 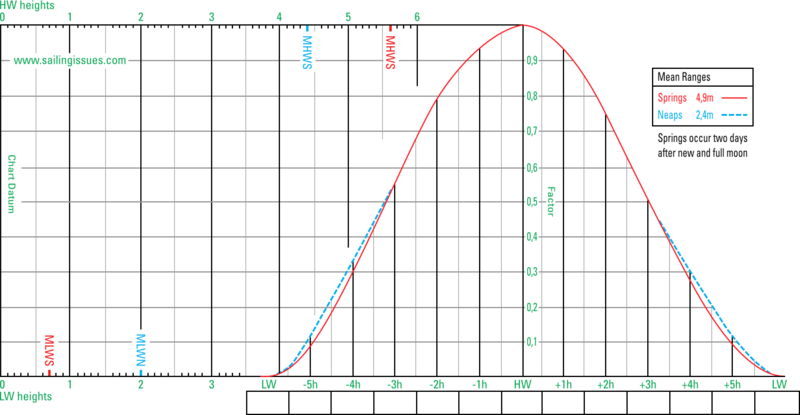 Semi-diurnal Tide: The most common tidal pattern, featuring two highs and two lows each day, with minimal variation in the height of successive high or low waters. Diurnal Tide: Only a single high and a single low during each tidal day; successive high and low waters do not vary by a great deal. Gulf of Mexico, Java Sea and in the Tonkin Gulf. Mixed Tide: Characterized by wide variation in heights of successive high and low waters, and by longer tide cycles than those of the semidiurnal cycle. U.S. Pacific coast and many Pacific islands. Chart Datum or Tidal reference planes: These fictitious planes are used as the sounding datum for the tidal heights. Drying Height: Clearance in meters (or feet in old charts) above the chart datum. Charted Depth: Clearance in meters (or feet in old charts) below the chart datum. Observed Depth: Height of tide + charted depth: the actual depth in meters. Height of light: The height of light above the bottom of its structure. Elevation: The height of the light above the chart datum. Rule of Twelve: Assuming a tidal curve to be a perfect sinusoid with a period of 12 hours. The height changes over the full range in the six hours between HW and LW with the following fractions during each respective hour: 1⁄12th ; 2⁄12th ; 3⁄12th ; 3⁄12th ; 2⁄12th ; 1⁄12th of the full range. Rule of Seven: The change from spring range to neap range can be assumed linear, each day the range changes with 1⁄7th of difference between the spring and neap ranges. Hence, the daily change in range = (spring range - neap range)/7. The rule of seven is also used to find rates of tidal streams between neap and spring rates. Rule of Twelve: Assuming a tidal curve to be a perfect sinusoid with a period of 12 hours. The height changes over the full range in the six hours between HW and LW with the following fractions during each respective hour: 1/12 2/12 3/12 3/12 2/12 1/12. Rule of Seven: The change from spring range to neap range can be assumed linear, each day the range changes with 1/7th of difference between the spring and neap ranges. Hence, the daily change in range = (spring range - neap range)/7.